Ever wondered what to do with leftover card stock pieces from an unfinished scrapbook project? If you whirl like me, you have the best intentions, gather the supplies, only to start and leave the project for another date. And another. And another. 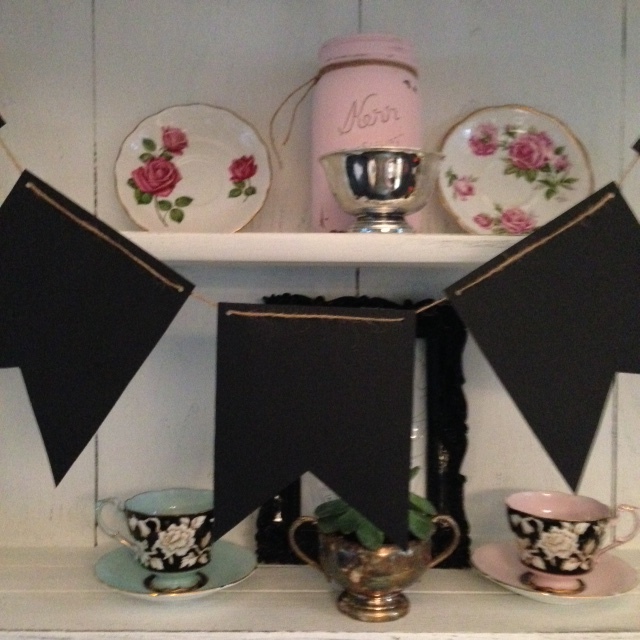 A talented lady invited me for coffee one morning and showed off some of her recent pennant styles. You may recall this same talented woman is the mind behind the vintage cloth pennants I posted on an earlier post. It is the found and repurposed fabrics, the details, and her design flair that make these pennants so bespoke. 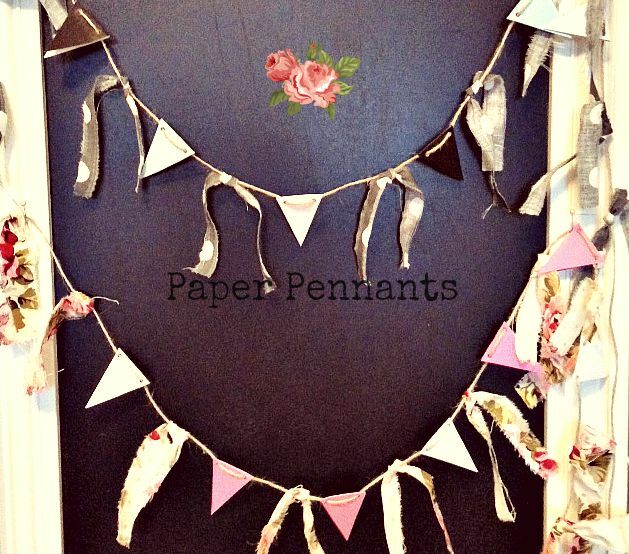 Paper Pennants are a clever way to reuse and repurpose some of your leftover paper supplies. I purchased the cardstock for both pennants from a local Dollar Store and selected trending shades and colours that I am fond of: pinks, turquoise, and shades of grey. Of course you could make these pennants from fabric scraps, worn jeans, beautiful cards, black and white photocopied photographs… Let your imagination loose. The purchased fabric was from, Hobby Lobby and Fabricana. At home I put the generations to work tracing diamond pennant templates onto cardstock. We chose seven small pennants per string. Sharp scissors keep the diamonds “perfect.” Fold your diamonds in half and make a sharp crease. Using a small hole punch from Michaels’ Crafts, I punched two openings into the top ends of the folded diamond. Gather your twine. Lay your pennants onto a table. Pattern, number, and space as you wish. Cut a length of twine, five times the length of your pennant. I do this purposely; I would rather have a string too long than too short. Tie off one of the ends of twine. I make a knotted loop to attach to a small nail or push pin. Thread your pennants onto the twine and space them as desired. A voice niggled in my mind, “Posh it up.” A bag of fabric provided the style oomph. I tore some bits of coordinating fabric and knotted the scrapped ties in between the spaced pennants, adding two fabric ties to complete each end of the pattern. Decide on the desired length. Tie off the opposite end of twine and hang your pennant. These card stock pennants are the perfect addition to a baby gift, celebration, or event. 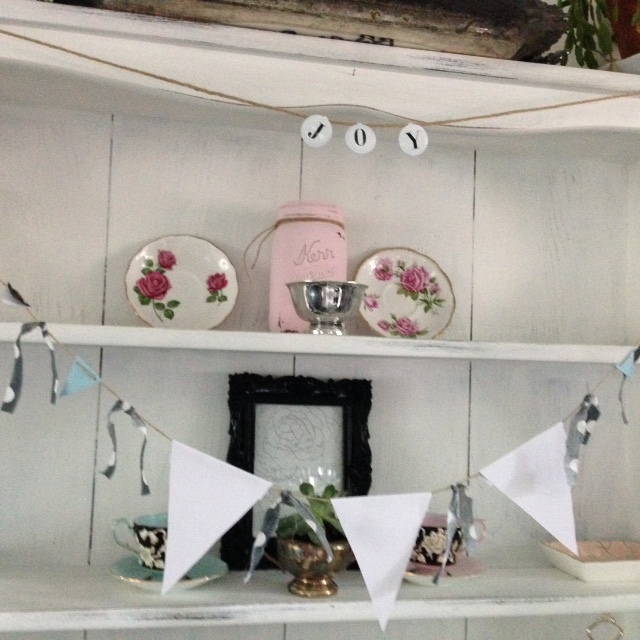 Pure whimsy and shabby vintage enhance and warm any space. Pennants created by loving hands add homemade glamour, a sense of nostalgia to any space, and silently whisper their stories forth.